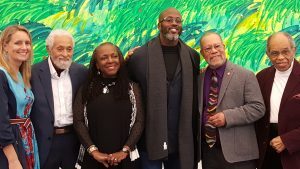 Saturday, October 20, 2018, was the special opening reception of Our Voice: Celebrating the Coretta Scott King Illustrator Awards at the Eric Carle Museum of Picture Book Art in Amherst, Massachusetts. 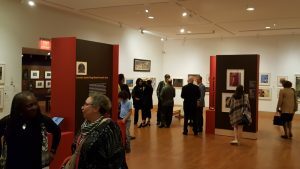 This traveling art exhibition was assembled through the collaboration of the American Library Association and the National Center for Children’s Illustrated Literature (NCCIL). This exhibition features 100 works of art from 38 CSK winner and honor illustrators and remain on view through January 27, 2019. Our Voice is the largest and most comprehensive presentation of CSK illustrator winners and honors ever assembled since the illustrator award was established in 1974. Several of the CSK illustrator winner and honor award recipients were present at the opening reception. The illustrators include George C. Ford, the first recipient and winner of the CSK Illustrator Award in 1974; Reynolds Ruffin, 1997 honor awardee; JoeSam, 1988 honor awardee; Charles R. Smith, Jr., 2010 award winner; Gordon C. James, 2018 honor awardee; and Ekua Holmes, 2018 award winner. 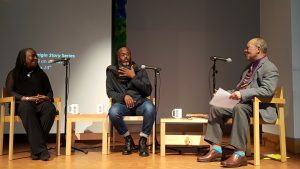 A special one-hour program in the auditorium featured Ekua Holmes and Gordon C. James in conversation with Jerry Pinkney. This exhibition was curated by Ellen Keiter, chief curator at The Eric Carle Museum and her super creative staff. iPad stations were provided where visitors had the opportunity to listen to audio clips of many of the artists speaking about their work in their own voice. In addition, small cards with quotations by Coretta Scott King were provided free for guests to take home. This is a remarkable exhibition. If you are in the greater Boston area, please visit and make the trip with family or colleagues.